1980 yellow covered Loompanics edition of Principia Discordia. The Truth Shall Set You Confused… in 2,500 words or less! The details surrounding this rare 1st edition are enshrouded in as much myth and mystery as the JFK assassination itself, which—it so happens—will be forever linked to Discordianism due to its association with Discordian Society co-founder Kerry Thornley who served with Lee Harvey Oswald in the Marines. 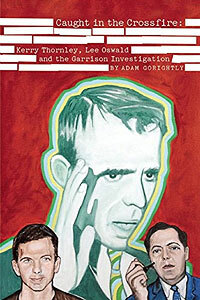 Curiously enough, Thornley was writing a book based on Oswald three years before the Kennedy assassination and afterwards testified before the Warren Commission and was later accused (ridiculously so) by New Orleans District Attorney Jim Garrison as being part of a JFK assassination conspiracy. Thus was birthed the legend of how this mostly missing 1st edition was copied on a Xerox machine belonging to the very same man, Jim Garrison, who would later link Kerry Thornley to a shadowy cabal that allegedly orchestrated Kennedy’s awful offing. During the course of researching The Prankster and the Conspiracy: The Story of Kerry Thornley and How He Met Oswald and Inspired the Counterculture (2003 Amazon), I exchanged email correspondence with Lane Caplinger’s sister, actress Grace Zabriskie. For some reason, it’d never dawned on me to ask Grace about the legend of the 1st edition—probably because Grace, by her own choosing, was never really part of the Discordian scene. Lane’s response now leaves us in a quandary and seems to put the kibosh on this whole wonderful mythos that the PD was created right under Jim Garrison’s nose by a diabolical Discordian conspiracy. In the IllumiNet Press introduction to PD, Kerry Thornley identifies 1964 as the year of the publication of the 1st edition and that Greg Hill and Lane Caplinger were the culprits. Thornley moved to Arlington, Virginia in late 1963 through 1964. Meanwhile, Greg Hill returned to New Orleans in 1964 and was there until mid-1965, which was the relevant period when the 1st edition was published. My working theory is that Lane Caplinger did indeed run off some mimeograph copies of letters and writings by Hill and Thornley that later found their way into the first edition PD. However, it’s my impression that Lane had but a vague idea at best of what she was involved with—other than just copying some material for a couple of friends who were tinkering around with a joke religion called Discordianism. As Greg Hill noted, only five copies of the 1st edition Principia Discordia were produced, most of which were lost. 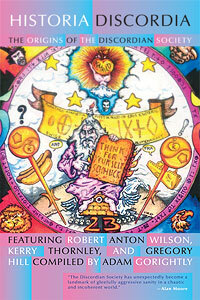 Later iterations of PD departed greatly from that long ago 1st edition, evolving into a collaborative art project that included the involvement of such notables as Robert Anton Wilson (Mordecai the Foul), Robert Shea (Josh the Dill), Camden Benares (The Count of Fives), Robert Newport (Rev. Hypocrates Magoun), Bob McElroy (Dr. Mungojerry Grindlebone)—and, of course, Thornley and Hill. I first became involved in researching this craziness in the late-90s when I was overtaken with an obsession of writing a biography of Kerry Thornley, who had captured my imagination not so much due to my interest in Discordianism (that would come later) but because of all the other high weirdness surrounding his life. In this Kerry Thornley-National Archives package were documents related to Jim Garrison’s investigation, including 36 Discordian related pages which didn’t mean a whole lot to me at the time as I was more interested in getting to the bottom of Thornley’s alleged Kennedy assassination associations than I was all of this Discordian doo-dah. If I’d been paying closer attention, I would have noticed that these Discordian related materials appeared to be the first edition of Principia Discordia, Or How the West Was Lost—or at least a collection of writings from the early days of The Discordian Society. These same materials were later identified in 2006 as the 1st edition PD by a fellow named Karl Musser, who came across the material during a visit to the National Archives. National Archives version of Principia Discordia, Or How The West Was Lost. At the time, Musser shared these documents with Discordian historian Dr. Jon Swabey who afterwards transcribed this apparent 1st ed. PD and posted it on the Internet via Creative Commons. At the time, I was unaware that the Musser/Swabey tag team had brought to the Discordian world this apparent 1st edition PD. A couple years later, Dr. Robert Newport passed on to me Greg Hill’s Discordian Archives, consisting of all 5 editions of PD. However, the discovery of these different PD editions wasn’t immediately apparent and it took me some time to sift through the Discordian Archives and identity exactly what was what. The most amazing discovery of all was an actual honest-to-Goddess copy of the first edition of Principia Discordia, Or How The West Was Lost, numbered one of five, written in Greg Hill’s own hand. of the 1st ed. Principia Discordia, numbered 1 of 5. My discovery of the Holy Grail of Discordianism led to a period of intensive research into the history of PD. After a review of the Musser/Swabey/National Archives version of PD, I initially arrived at the conclusion (which I now consider erroneous!) that the National Archives version was a later and incomplete reproduction of the 1st edition PD. However, more recently I’ve come to suspect that the National Archives version is actually an early draft of PD. For sake of clarity, I’ll henceforth refer to these two different versions of Principia Discordia, Or How The West Was Lost as: 1) the National Archives (NA) version, and, 2) the Discordian Archives (DA) version. Although there are similarities between these two versions—the NA and DA—there are also a number of differences, one of which is the type font. Secondly, the NA version numbers only 36 pages while the DA version comes in at a whopping 60 pages including a number of illustrations that do not appear in the NA version. At first glance, I was a bit befuddled by this address because Thornley’s Warren Commission testimony stated that he’d moved to Arlington, VA in late 1963 and lived there until late 1964. But after giving it some thought, I remembered correspondence in the Archives where Thornley noted that he’d stayed for a period of time—in late-1963/early–1964—with his friend Robert McDonald in Maryland before his Arlington move. This provides further evidence that the NA version actually predated the DA version, and that some of the content in the NA version (as my theory goes) were pages Lane Caplinger ran off on Jim Garrison’s mimeograph machine. Cover page of National Archives version of the 1st ed. Principia Discordia. Cover page of Discordian Archives version of the 1st ed. Principia Discordia. Additionally, my colleague Grouchogandhi pointed out that on the title page of the NA version the author is listed as “Malaclypse the Younger, H.C.” The curiosity, in this instance, is the title of “H.C.” In subsequent editions of the PD—including the 1st edition in the Discordian Archives (DA)—Malaclypse is referred to as “K.C.” (Keeper of the Chao) and in later editions as “K.S.C.” (Keeper of the Sacred Chao). Title page of the National Archives (NA) version of the 1st ed. Principia Discordia. Title page of the Discordian Archives (DA) version of the 1st ed. Principia Discordia. The third page of the NA version consists of a Legion of Dynamic Discord (LDD) certificate awarded to early Discordian Barbara Reid. Conversely, this certificate does not appear on the third page of the DA version. However, there is a blank LDD certificate on page 55 of the DA version, which suggests that the NA version was sent from Kerry Thornley (aka the Bull Goose of Limbo) to Barbara Reid in 1964 and included a signed LDD certificate as confirmation of Reid’s ordination into the Discordian Society. Legion of Dynamic Discord certificate awarded to Barbara Reid which appears on page 3 of the National Archives (NA) version of the 1st ed. Principia Discordia. Blank copy of Legion of Dynamic Discord certificate that appears on page 55 of the Discordian Archives (DA) version of the 1st ed. Principia Discordia. So how, pray tell, did this early Principia Discordia draft wind up in the House Select Committee on Assassinations (HCSA) files? My guess is that Barbara Reid provided the document to the HSCA in the late-70s when she testified before the committee regarding her claims that she saw Kerry Thornley in the company of Lee Oswald in New Orleans in September of 1963. However, another person who might have submitted this document to the HSCA was assassination researcher Harold Weisberg, who worked closely with Barbara Reid during the Garrison Investigation period and entertained the notion, at one time or another, that the Discordian Society was some type of CIA front organization involved in the Kennedy Assassination dance party. Adam Gorightly presents a brief introduction to the 1st edition of the Principia Discordia, courtesy of Brenton Clutterbuck of Chasing Eris. Adam Gorightly presents the 1st through 5th editions of the Principia Discordia. This entry was posted in barbara reid, book, camden benares, discordian timeline, discordianism, greg hill, illuminati, illuminet press, jfk, jim garrison, kerry thornley, lane caplinger, lee harvey oswald, monkey business, official business, principia discordia, robert anton wilson, robert newport, robert shea, video, warren commission, writings. Bookmark the permalink. Didn’t Roger Lovin loan Weisberg a Discodian file or at least some kind of file? I think he talks about his encounter with Weisberg in the thing he wrote about Garrison in The Ungarbled Word. I could be wrong. Take a look at the stuff I sent you on Lovin and see if it mentions it. Yes, Tim, Weisberg received some Discordian materials of some sort from Lovin, which could account for what was unearthed from the National Archives. I considered adding this Lovin-to-Weisberg-Discordian-materials-info to the article, but decided not to because the damn thing is so convoluted to begin with. But that is indeed another angle that only Thornley/JFK Assassination nerds like ourselves could appreciate. Adam, After writing my comment I follow the link to the Was the Discordian Society a CIA Front post and saw that the Lovin info was in there..